Contract employee for Astral and Shinto specialist. 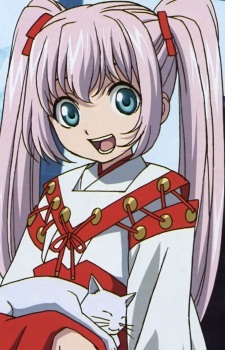 She was part of the Katsuragi family (practitioners of shinto) but became part of Astral after she ran away from home. She is the youngest of the group and adds Onichan most of the time when she talks about Itsuki. (Though not related) Her side jobs include writing charms and conducting ceremonies. She seem to have left home because of a complex she had concerning her talented sister but later it was resolved. Currently a 3rd year primary school student.